Overall we're really happy with optimisations that Thermaltake have done with the Level 20 RGB Mechanical Gaming Keyboard. The aluminium top plate with it's bevelled bottom edge along with the RGB strips running down the middle and around the keyboard make for an extremely striking look, while this might not be to everyone's taste it certainly appeals to the RGB lover in us. The inclusion of the audio & USB pass through ports are always welcome as a feature. The pass through ports along with the cut out beneath the light bar that separates the number pad area, which is also useful for running a headphone wire through, is great for cable management and keeping your desk tidy. One disappointing feature is the Thermaltake companion app, while you can use it for changing light effects, or as a virtual keyboard or controller, the use cases are a little thin on the ground, we found it was often more time consuming to use the phone app when the iTake engine is available straight away on your PC. The virtual controller does need some work for it to be usable for anything more than simple games, there is only the option to use a directional pad set up and this doesn't accept multiple inputs, we would like to see a virtual thumb stick that can be seen in many recent mobile games. 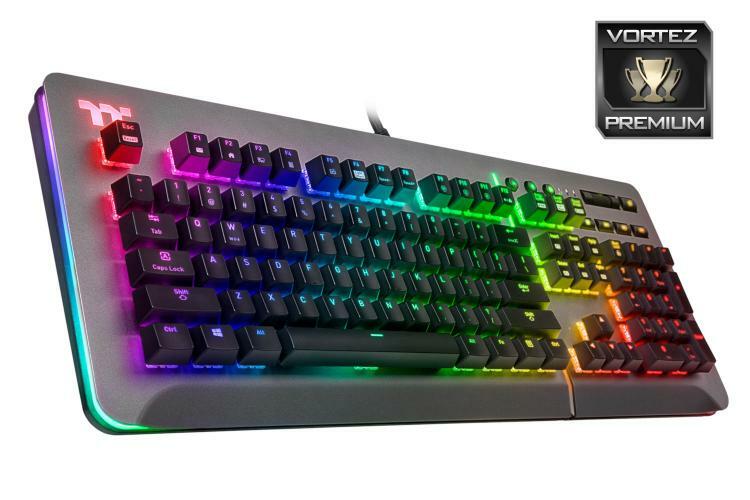 Coming in at £149.99 GBP, $149.99 USD & $199.99 AUD the Level 20 RGB Mechanical Gaming Keyboard is on the higher end of the pricing spectrum, but the feature set definitely lives up to its pricing and then some, with this in mind we would like to award the Thermaltake Level 20 RGB Titanium our Premium award. The increase in price is justified by the increase in build quality, so we would recommend this over the previous X1 model.